Values and practices within the profession of speech and language therapy are based in deeply embedded assumptions that form a tacit knowledge base, not always accessible to practitioners and students of speech and language therapy. 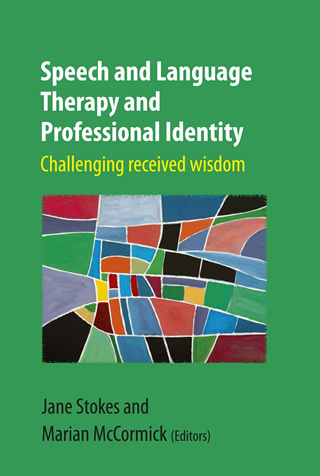 Received wisdom about what a speech and language therapist (SLT) does greatly influences the development of professional identity. Unspoken sets of values that surround the work of SLTs in the UK in the 21st century are often unchallenged and unexplored in the professional literature. Reflecting on the ways in which our universities and placement experiences prepare student practitioners for their career, we are faced with a range of unarticulated prejudices and preconceptions. This book aims to explore and challenge the ways that students are prepared for professional practice. It reflects a diversity of views and will contribute to a broader, richer conversation about issues that lie under the SLT profession. ...In the conclusion to their book, Jane Stokes and Marian McCormick wrote that they hope it makes you think "Hmmm..." - it certainly does. There are a number of chapters I'm looking forward to re-reading and think I'll review regularly. Marian's chapter about reflective practice inspired me, and reminded me that one outcome of reflection needs to be a goal for the future. Aoife Gallagher's chapter "To intervene or not to intervene" had me nodding with agreement. I've been considering the role of parental expectations, fear and anxieties in my own clinical work so was interested to read Aoife's ideas about how to make services transparent and responsive. In her chapter about supervision Jane introduces models from related fields, that we in speech and language therapy can learn from. Keena Cummins' chapter on using video clarified issues I'd been struggling with in my therapy sessions. Her analysis of the value of face watching and mirroring between adults made me reflect on some recent interactions with parents. I hadn't considered the link between spirituality and speech and language therapy. I enjoyed Sophie MacKenzie's chapter on this topic, which discussed the narratives clients use at different points in the therapeutic journey and person-centred care. I was scribbling down thoughts and questions as I read this book and enjoyed how it encouraged me to consider why I do what I do. If you're a therapist who enjoys asking why and getting stuck in to some interesting discussions, I think you'll enjoy this book. The book includes quote from students of Jane and Marian's course, I was stunned by how insightful they were. If you're looking to hire a new grad keep your eye out for therapists from the University of Greenwich! Jane Stokes is currently Senior Lecturer in Speech and Language Therapy in the School of Health & Social Care, University of Greenwich. Her primary area of teaching is in developmental language difficulties in children, with a special clinical interest in bilingual children. Additionally she teaches on professional development in speech and language therapy, outcome measurement, and evidence based practice. Marian McCormick has been a practising SLT for 25 years, in which time she has worked in a variety of settings in the UK, New Zealand and Australia. She is now Programme Director on the Postgraduate Diploma in Speech and Language Therapy at Canterbury Christ Church University. Since joining the university in 2006, her interests in learning and teaching and integrating reflective practice into SaLT education have underpinned her work.